I approach every active transportation project I work on as if it has the potential to improve the quality of life for families, neighborhoods and entire cities. Through well-designed complete streets, bikeways, greenways, and safe routes to school, we can free parents and children of the worries about the perils of getting where we need to go and liberate ourselves to concentrate on whom we’re with and the pleasures of our surroundings. The results of a concerted team effort on the part of governments, transportation thinkers and designers, businesses, activists and individuals cannot be overstated: personal and broad public health benefits; an improved environment that restores ecological functioning; and aesthetically pleasing urban fabrics that foster economic and community growth. I see a future where the principles of safe, active transportation are mainstream and designers and planners are able to push those goals even further, toward improvements we haven’t imagined or needed yet. I ride around Los Angeles with my daughter on the front of my bike and I envision the city I want her to live in, the future I want her to have riding her children around. I see in my mind all of the other happy families that will someday feel comfortable biking and walking around, too, and I smile and feel good about the work we do at Alta Planning + Design. Emily Duchon is experienced in helping communities design and implement innovative active transportation solutions, taking projects from master plans through concept design and construction drawings and administration. Her project experience includes bicycle, pedestrian and trail master plans as well as complete street, multi-use trail and wayfinding design. 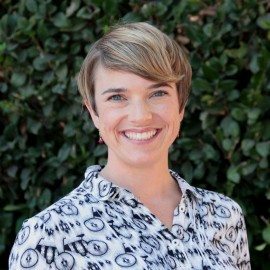 Emily’s creativity, energy, and experience in ecological design give her the tools to create vibrant public spaces and transportation networks in communities. Emily’s ability to conduct successful community outreach efforts is a valuable asset for building project support and community investment in her projects. Emily is also skilled in leading consulting teams through construction document development.